Where is the Best Place to Sit in our Classroom? 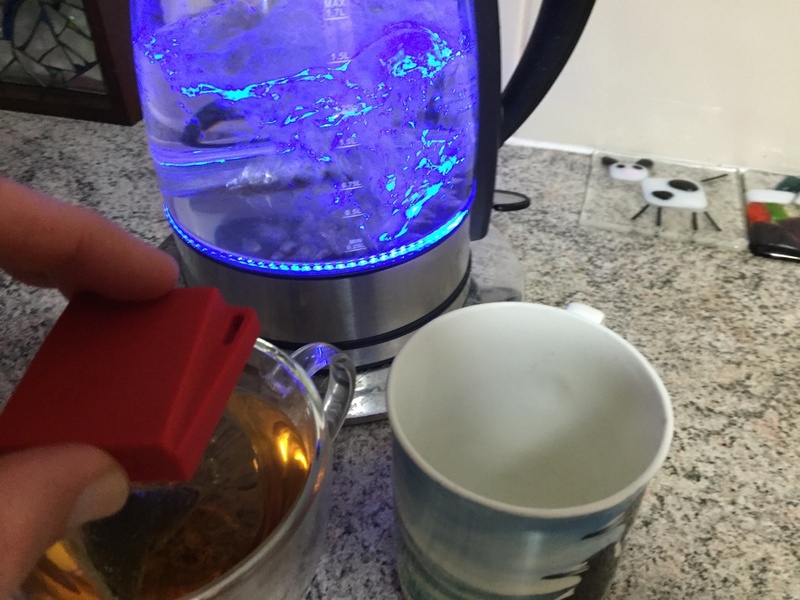 Which is the best cup shape for my cup of tea or coffee? Could I use barometric pressure to measure altitude? Could I use light intensity to measure distance from the light source? Could I use the magnetometer as a compass? Could I use the accelerometer to measure distance and velocity of a moving object? Could I use the accelerometer to control a screen object? Like most of the best STEM-active questions, the answer is ... It depends! Some people feel the cold more than others, and like to sit near a heater. For others, they want to be as far away from the heat source as possible. Some like to sit where the light is bright. There are numerous factors that determine our preferences, and these can be easily explored using the TI-SensorTag. 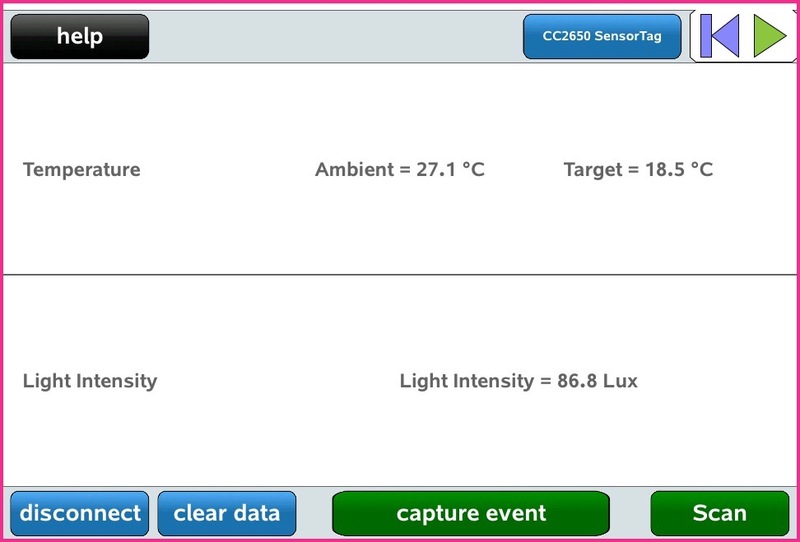 Just select the Temperature and Light Intensity sensors on start-up, and use the Capture Event button to grab the readings at different points around the room. This can even be set as a game challenge. In the past, I would go into the room before the students and collect temperature and light data from several points, then display the graph to the students and ask them to decide where these spots are located! It offers a fun and worthwhile challenge. 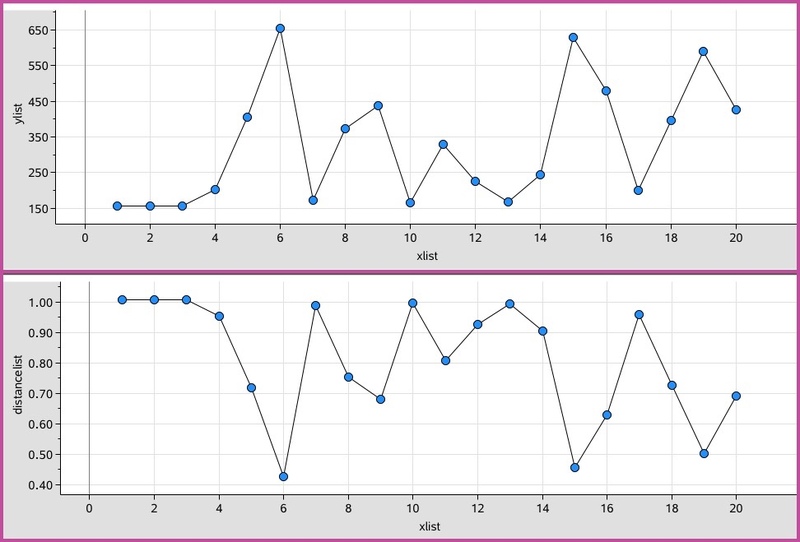 Students might record temperature, humidity and barometric pressure for a week and compare that with the published data. Or have them record the changes in temperature, humidity, light intensity and barometric pressure throughout the day. How accurate is the data they collect? How might they validate this? How might the barometer be used to predict the weather over the coming days? Note: MyWeatherCenter is an iPhone/iPad app that links with the SensorTag to provide readings for local temperature, humidity and barometric pressure - which can be compared to the current readings for your location from the web! Not free but well worth a look! 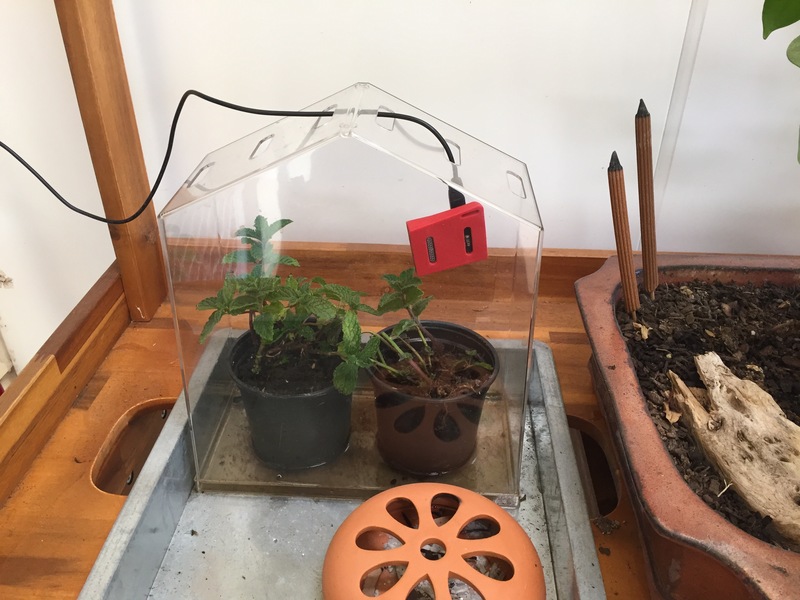 Why not use the SensorTag to monitor conditions in their own model greenhouse AND to raise alerts when things might get challenging for their plants? The SensorTag includes red and green LED lights and a small buzzer - these may be programmed easily to raise a warning when temperatures get too high or too low, when humidity becomes oppressive - or even when it gets dark! What factors are most likely to impact the optimal growth of greenhouse plants? How might these be monitored? 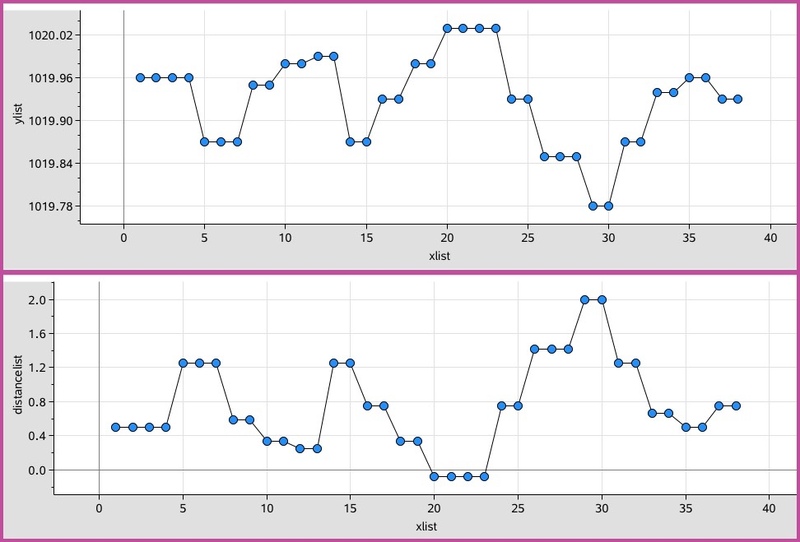 Invite students to investigate accelerometer data as they move around - can they identify x, y and z axes? Could they use the accelerometer to count the number of steps they take when walking? How does this correspond to the other movement sensors? How might they design experiments that will reveal the meaning of what they see? Perhaps link these sensors to a heart rate monitor and study the effects when exercising, or dancing? Which cup will keep my drink hot (or cold) longer? 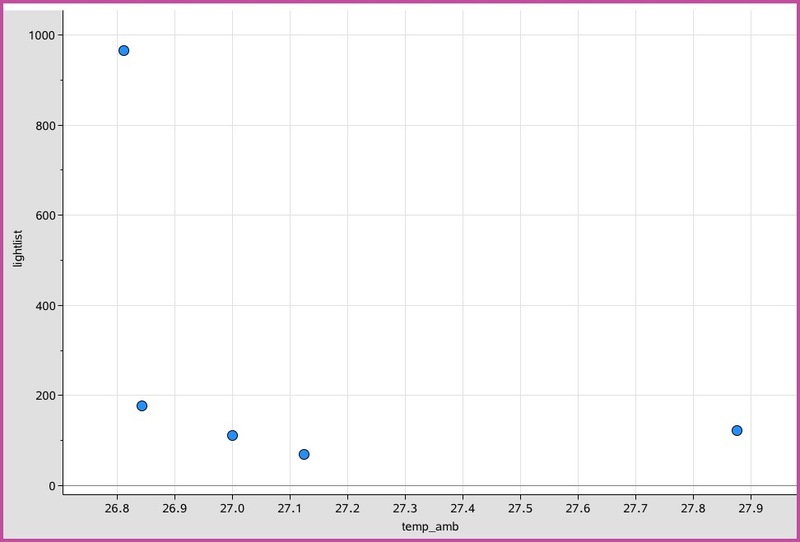 Record the cooling over time using the InfraRed Temperature sensor. Use the Calibrate feature to capture events at regular intervals for, say 30 minutes. Can you account for observed differences? How might the most effective exploration be designed? 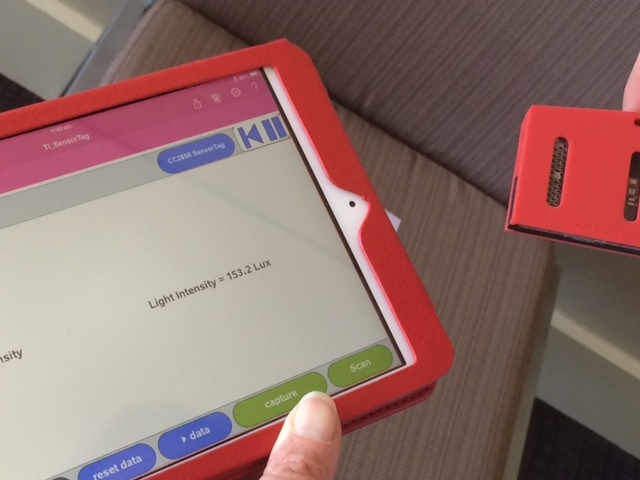 How might their readings be calibrated and converted: changing light intensity to metres? How might magnetometer data be converted to give compass headings? Can you account for observed differences? How might the most effective exploration be designed? How accurate is the data they collect? How might they validate this? This one could be challenge, but may not necessarily be just for the senior calculus students. Under controlled conditions, acceleration data may indeed reveal more than we might expect, but what are the limitations? Another challenge, but with considerable rewards for students who are interested in such things as 3D graphics and gaming. 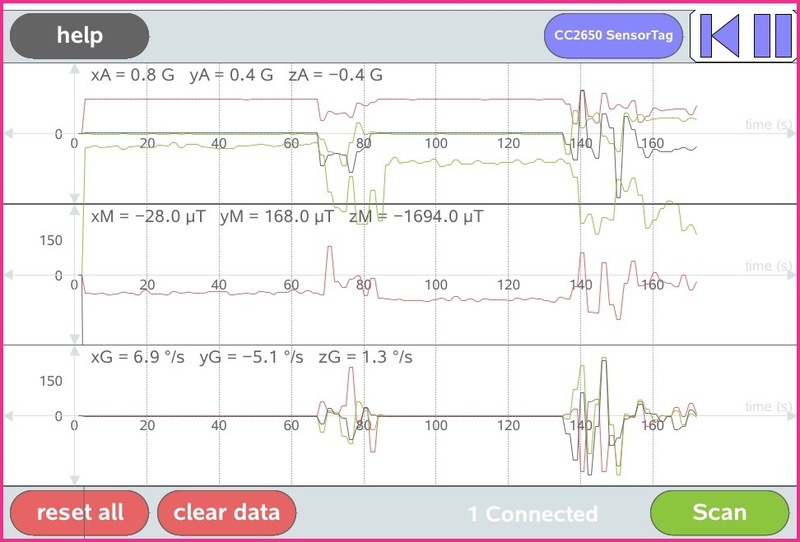 A fun introduction to the movement sensors - control a virtual robot! The SensorTag buttons will start and pause, the accelerometer (or other selected sensor) will steer. The challenge here is to try to "stay between the lines"! 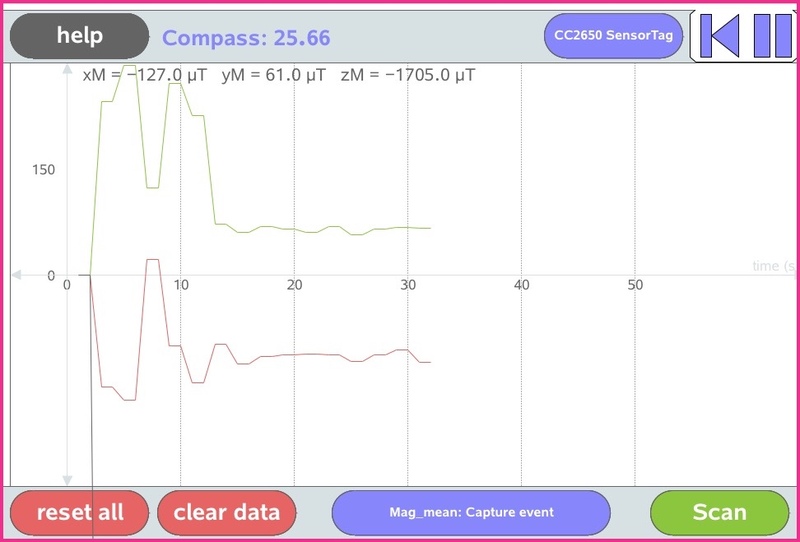 The 3D accelerometer data is readily accessible from the SensorTag, so students may access it using TI-Nspire native tools, and performs calculations and conversions in the more familar environment without needing to know Lua scripting. If you have a SensorTag and happen to be using the Chrome browser on a recent (mid-2012+) Mac, Android (M) or ChromeBook, then try it out right now! 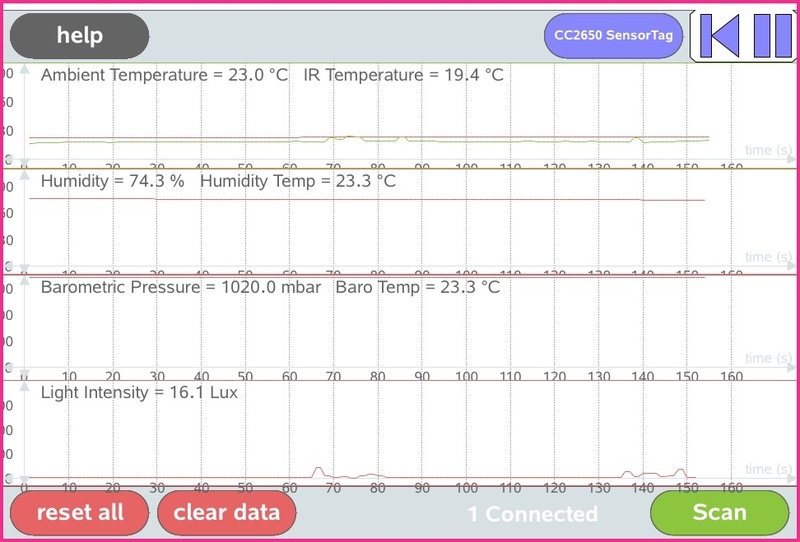 Just click the Connect button at the top of the page and see the TI SensorTag in action! Pressing the buttons below, you can turn on/off the LEDs and the buzzer. When you press the buttons on the side of the CC2650, the indicators on either side of the picture will be highlighted.